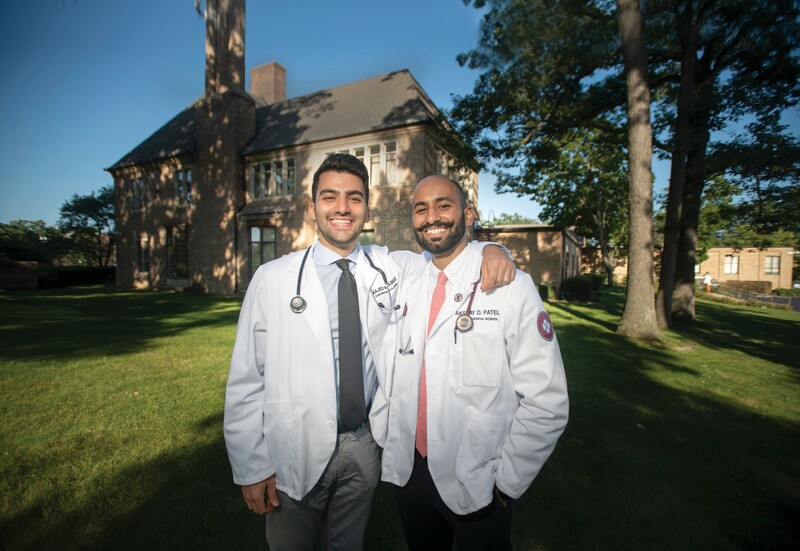 Majed Abbas, CMS ’21, and Akshay Patel, MS ’15, CMS ’21, serve as president and vice president of the student-driven Interprofessional Community Clinic, which serves uninsured members of the local population. Now in its sixth year, the Interprofessional Community Clinic immerses students in a forward-thinking model: interprofessional, integrated, team-based health care for all, regardless of ability to pay. The RFU student-driven Interprofessional Community Clinic (ICC) is a healthcare safety net for the uninsured. It's an incubator for new ideas to improve care. It's a place of deep, experiential learning for future health professionals who are eager to put their ideals into practice. 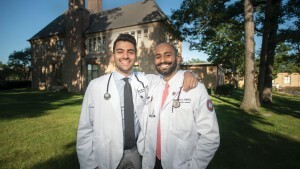 "Many of our patients have nowhere else to go and we feel that's not acceptable," said second-year medical students and ICC leaders Majed Abbas and Akshay Patel, MS '15, who prefer to speak in one voice about advocating for vulnerable populations. "One of the initial goals of the ICC was to provide, in addition to medical care, specialty services like behavioral health, physical therapy and podiatry that are hard to come by for those who can't afford them," they said. "We have an obligation as a society to give everyone the opportunity to live their best life. We firmly believe in that. Giving anything less than our best effort in achieving that goal is a disservice to both our profession and our duty to simply be good people." Majed and Akshay, who serve as president and vice president of the Interprofessional Community Initiative (ICI) that operates the clinic, gave a tour of the ICC on a Thursday evening in September. Located on two floors of the Rosalind Franklin University Health Clinics (RFUHC) just south of the RFU campus, it was in full swing as dozens of student participants in crisp white coats, representing numerous clinical programs, including medicine, podiatry, physical therapy, pharmacy, physician assistant, nursing and psychology, attended to both patient care and administrative tasks under the oversight of licensed faculty providers. "The ICC truly demonstrates how we are an IP mission-driven university," said Clinic Director April Newton, PT, DPT, MA, FNAP. "Students exemplify this through their work here, but also as they go into the community for their clerkships and rotations. We're building clinicians who have a professional identity and also an interprofessional identity." Students work on committees through the ICI to oversee every aspect of the ICC, including student training and scheduling, care coordination, patient advocacy, public relations and research — collecting data for potential grant funding. ICI members work closely with a faculty advisory board. "We've built a very good relationship with faculty and that definitely shows in how we're able to work together and get things done," Majed said. Melissa Chen, MD, ICC internist and clinical director, credits students' passion and dedication in making a difference in the lives of hundreds of patients and improving the health of the community. "We're taking an interprofessional holistic approach to each patient, which is incredible for our patients who have no access to other health services," Dr. Chen said. "Patients can come here for so many medical services and for vaccines and labs — all for no cost." ICC IP team members Jessica Matthiesen, CMS '21, and Hilary Powell, COP '19, have learned to be resourceful, to think about patient care from a different perspective. "I've learned how to navigate cost issues, how to help our patients who can't afford copays let alone the full cost of expensive prescriptions," said Jessica, who knows which pharmacies offer at no or reduced cost, medications like lisinopril for high blood pressure and atorvastatin for high cholesterol. Hilary takes patients' medication histories and scrutinizes dosages for effectiveness and potential interactions. "It gives you a new perspective to interact with and learn from patients who you may not meet on hospital rotations or community rotations, where time constraints are still an issue," Hilary said. Small IP teams of students greet each patient, take and chart a medical history — advanced students perform a physical exam — present to a team of faculty attendings, then work together to create a treatment plan. "You learn about the roles and responsibilities of other professions — pharmacy, physician assistant, nursing, allopathic medicine," said Akshitha Sreeram, SCPM '21, a clinic manager, who noted that student clinicians also learn how to present to attendings. The ICC receives referrals from the RFUHC mobile health clinic, Community Care Connection, and, in turn, can refer complex cases to community partners Erie HealthReach and the Lake County Health Department. Many ICC patients are diagnosed with or seek care for chronic, preventable health conditions: Type 2 diabetes, hypertension, hyperlipidemia or high cholesterol. Manual laborers seek treatment for back pain and other musculoskeletal injuries. Doctor of physical therapy student Richard Vizcayno, CHP '20, said he's been able to help patients in pain with what he's learning in the classroom. "We're able to practice with patients in a safe environment before we go out to clinicals," he said. "We're here with professors and second-years. We're there for each other, working our way to be comfortable with new techniques." The ICC is a valuable recruitment tool for students seeking early clinical experiences. "The ICC offers students the opportunity for professional and personal growth and to learn about health care from the lens of underserved patients, faculty clinicians, staff, administrators and our many community partners," Dr. Newton said. You can help our students have an impact in the community and provide critical care to the underserved. Make a gift at rosalindfranklin.edu/impact.